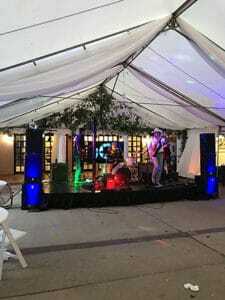 Astera event lighting and up lighting which are water resistant, wireless and battery powered for up to 20 hours. We can color match to any color on the spectrum. Custom monogram or design spot lighting (GOBO). We also offer advanced DJ lighting and movable lights! 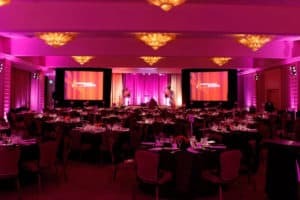 Interactive or non-interactive video dancefloor or walls to create a wall to wall event experience and set the mood, such as rose petals on the dancefloor or wall. These are an inexpensive way to create your theme throughout your event space. Professional sound equipment for any size event! Make your event stand out with this state of the art photo booth! We are proud to offer the only 48-inch touchscreen photo experience on the market! Guests are photographed by our professional photographer and then the fun begins as they edit and add effects to their photos, then print, email or tweet! A guestbook can be made at the end of the event to save the memories. Best of all, you will receive digital images to share after the event. See a demo!